I had the honour of seeing Karen McGrane give a great talk on issues we are currently facing maintaining and publishing content for multiple platforms. Her Content in a Zombie Apocalypse talk at UX London 2015 covered the issues faced by content creators in an increasingly multi-output world.Basically, these issues have arisen from continuing to use the mental model that has underpinned print for the last seven hundred or so years. It's what’s Karen refers to as a ‘container first’ model - where the format of the content will dictate what content can go into it and how it can be presented. This model worked well for a long time. The thing is, although this model continues to be the dominant one, it doesn’t work any more. With the rise of mobile and tablet, we have been forced to give up the pretense of having control over input device, screen size, formatting and the mode of use. Karen took the example of in-car interfaces. These may soon take the form of a couple of hard-baked buttons with a primarily audio interface. A good question to consider about formatted content is how an audio interface should interpret an italicised piece of content (with an <i> tag) as opposed to emphasised content (<em>). The temptation is to claim this is an issue with markup - but this continues the container-first model, where the issue remains having to re-enter the same content differently for multiple platforms. This goes back to a particular pet topic of Karen’s: the war between blobs and chunks. Blobs are format-rich globs of content. They’re great if you’re only using them for one particular device or output and don’t need to do anything with them. Chunks, on the other hand, are format-free rich content. Well-defined chunks can get published to multiple platforms and outputs. The broad solution is to separate content from its container. This creates a new mental model - known as ‘content modeling’. Content Modeling involves two steps. First, understand the Type of content you are creating. 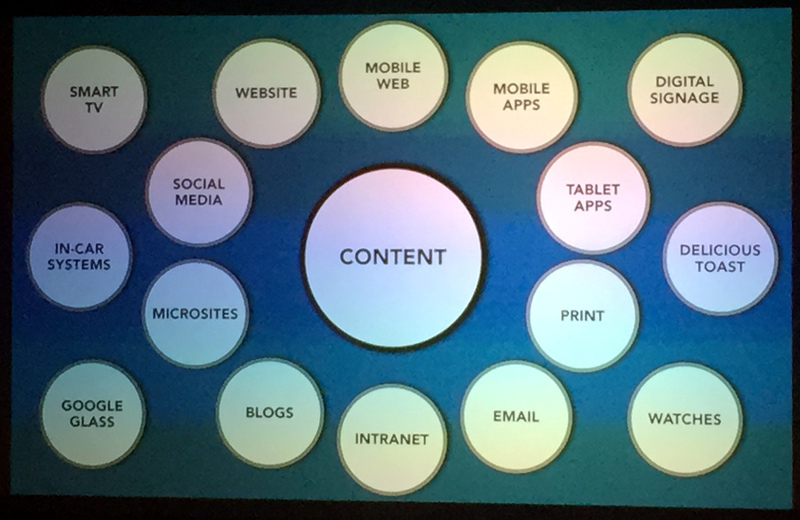 Interrogate the structure of these content types and their intended usage. Second, understand the Attributes of the content type. Knowing the ‘fields’ or ‘content objects’ attached to the type allows you to create a model for how the content can be input and then published out later. 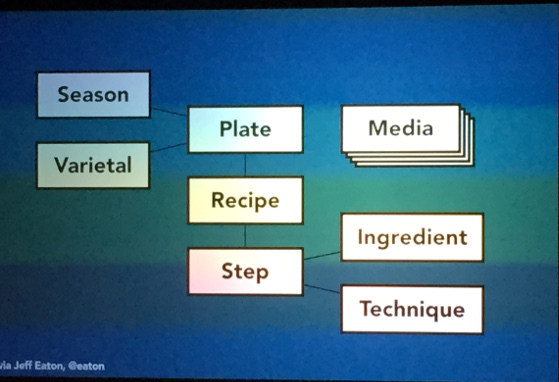 An example of an attribute mapping for a recipe content type, as provided by Jeff Eaton. I’ve read and heard Karen speak on various versions of this topic for years. It’s fascinating and difficult to get started, but speaking from experience, the quicker we can divorce ourselves from container-first thinking and design, the easier and more productive our professional lives can get. Although the two step content modelling process sound very simple, this requires a radical change of thinking and an investment at every level of the organisations we work within. Karen mentioned an Innovation report commissioned by the Sulzberger family when they were diagnosing digital publishing challenges at the New York Times - I think that’s a good start to get the conversation going with your senior teams. I know for a fact that there are several media and publishing organizations that are struggling with this very question at the moment - well, at least in Australia. (I can name at least one major publishing organisation that has spent millions of dollars creating a department and systems to manage this over the past five years), I’m willing to bet that the number struggling around this set of questions is significant. UPDATE: Karen has put up her slides on Slideshare.